Atmospheric stories from the New West Coast. It’s remiss of me not to have heard of Sarah Lee Guthrie and husband Johnny Irion, as several of my friends are already fans and BRIGHT EXAMPLES is a bright example of the rootsy Americana music that I normally love and cherish. 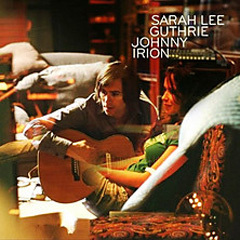 There’s not a bad song on the album and a few are genuinely excellent, with Sarah’s voice being warm, dreamy, rich and traditional all rolled into one and her husband, Johnny Irion has a neat, laid-back tone that compliments her dulcet tones perfectly on the harmonies and he also adds some quite exquisite guitar playing. A great example would be Never Far From my Heart which could easily have been recorded in Laurel Canyon but sounds as fresh as a daisy. On a couple of songs Sarah manages to sound like a cross between Stevie Nicks and a young Nanci Griffith; try listening to the transcendent Butterflies to see what I mean and the New Orleans piano led Seven Sisters which would never be off public Radio if it actually was by the Fleetwood Mac singer. Irion also takes lead on a couple of songs with Target on Your Heart including some pretty neat piano and pedal steel interplay; while title track Bright Examples sounds like a long lost Band track with it’s mournful harmonica and pump-organ. Possibly my favourite track on the album is the delightfully sad song Company I’m Keeping which has a tearful young woman singing over some gently crafted backing from pianist Rad Lorkovic and drummer Otto Houser. Lorkovic and Houser lead a long list of great guest musicians on BRIGHT EXAMPLES, including Neil Casal, Mark Olsen and Charlie Rose who all manage to add their own little bit of magic; but they never intrude on what is a very intimate album from a charming husband and wife duo.